With my frequent trips to the town of Santa Cruz, I always find some real gems which catch my eye in this fun town. Last year I wrote about their new round-a-bout intersection. Yes, I admit I usually look at surfers and sea otters - on this trip I kept seeing beautiful murals, sculptures, and traffic art throughout the streets. After some research, I discovered that we may even take a self-guided "SculpTOUR" through these Santa Cruz streets. You may even download a map and follow this walking tour. This has been made available because of a small organized program developed by the locals in 1998 to display local artists creations - which brings a fresh look at everyday scenes we walk and drive through. And, yes there are sand sculptures on the beach by the boardwalk too. I was particularly drawn to the Graphic Traffic project - art on the traffic signal cabinets throughout the city. 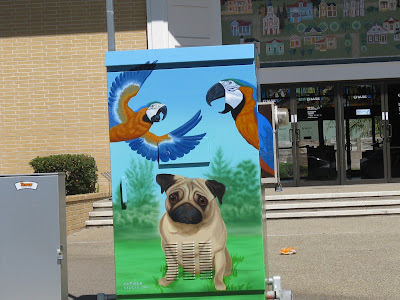 A neat way to disguise these cabinets on the streets! The murals and sculptures are created by local artists through a city program of the City of Santa Cruz Department of Economic Develpment and Redevelopment, Santa Cruz City Arts works with the Arts Commission, partners and stakeholders to guide and manage this public art program. Staffing is one person, part time. This program is "dedicated to bring creativity to the streetscape through diversity of placemaking projects, including temporary, permanent, temporal, small-scale and large scale installations". I continue to see more and more of these fun scenes made by local artists - of all ages. These people are the ones who actually live in and enjoy our small communities everyday. What an innovating idea to inspire the locals who live in our communities! And they camouflage the progress we sometimes find ourselves complaining of. Big city projects fighting with funds? Take note of how Santa Cruz came together to beautify. What ideas do you have to beautify your town? Did you like this article? Tell us below and please review the items in this sidebar and share with your friends. This Art Program was started in 1998 by a group of local residents, Public Art in Santa Cruz.